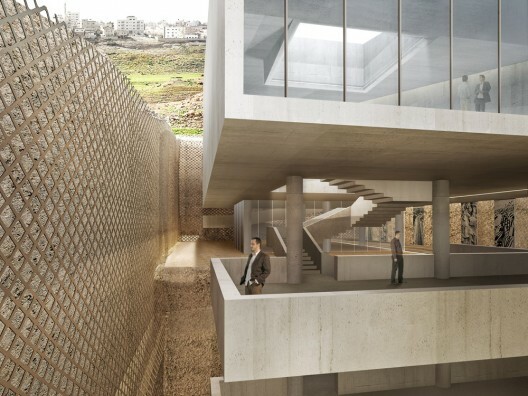 Ain Ghazal Interpretation Park is bridge to history that may never be built but its award-winning design makes a statement about heritage, community and Jordanian architecture. How to make a new beginning in East Amman? Ain Ghazal is a strategic location that has so far kept East of Amman intact, an expansion zone that enables the city – even the country – to modernize itself constantly, to make the tactical adjustments necessary boundaries and nodes had to be identified. It is a theatre of progress that cradles diverse elements and most importantly archeological ruins which belongs to 7250BC. The existing is an ambiguous condition. Because Ain Ghazal is the Old World, the "Cradle of history", there is an unspoken assumption that all its substance – even the most – mediocre is historic, and therefore has a right to eternal life. The idea of starting from scratch is literally unthinkable; in fact, such a renewal just resumes the perpetual cycle of construction, deconstruction, reconstruction that has been suspended out of fear of superimposition. 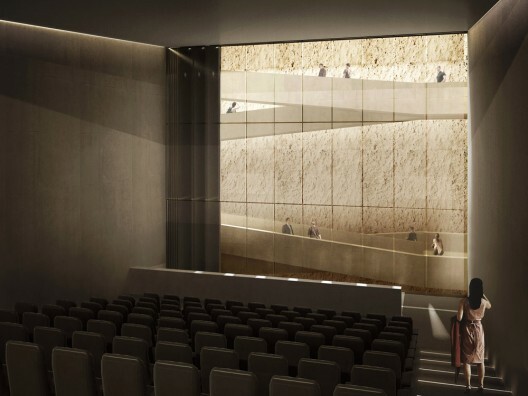 The key objectives of the project were to make Amman an important Cultural City; by Helping in widen the people's knowledge of the historical settlements and landmarks in the area and Awakening the memories of the historical layers of the site through the interpretation and presentation of the archeological site. 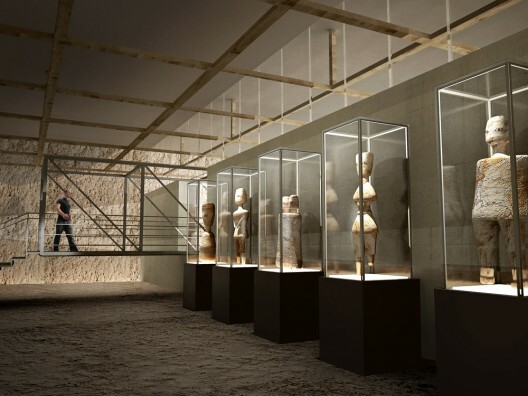 In Addition, it aimed to preserve Ain Ghazal as an important archeological site by sheltering its archeological fields through the use of appropriate technologies and management of the archeological site. Moreover this urban bridge re-links East and west of Amman on the macro scale and Marka and Tarek districts on the micro scale. We have used this project to generate a critical mass of urban renewal, to imagine an anti-utopian strategy that would transform, beyond the tabula rasa, the most banal economic givens into a utilitarian polemic, to interpret the archeology of Ain Ghazal as the gradual, progressive transformation of this chaotic "beyond" into a new urban system. 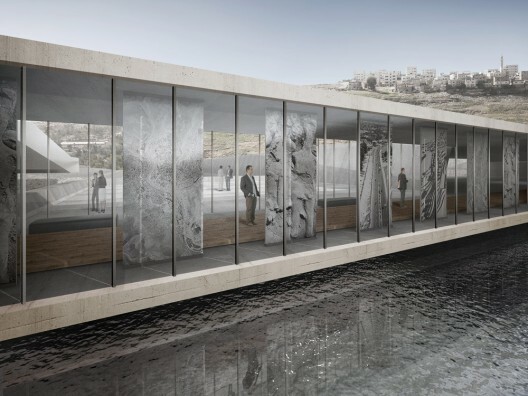 We propose to project a slice of lines across the entire field of the project's area – over all that exists including the present enclave of the Water Treatment Plant- and to expose progressively this new system as play of solid and void. The slice proposed here is at the same time conceptual and operational; it will not subject everything in its way to its discipline but will act as a filter to absorb those entities whose right to survive is not contested. Along its entire perimeter it will generate a string of hybrids. To achieve its ultimate coherence, it will invest the so far isolated fragments with a premonition of identity. The theoretical omnipresence of the grid does not imply homogeneous density: it will organize the coexistence of solid and void, density and emptiness. Around certain injections, the grid will allow different intensification where the highway will become almost incidental, just one of its orthogonal coordinates. Ain Ghazal as we know it will be liberated from its condition of enclave will dissolve over time to become simply part of the system. Moreover the project will mainly be concentrated on the banks becoming irrevocable linear, with a mass of program distributed along a 1km long link perpendicular to the stream, the impact would be diluted literally.